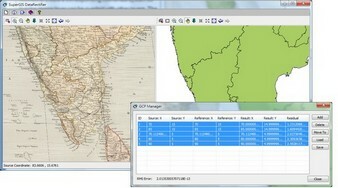 SuperGIS DataRectifier is a tool for spatial data rectification. 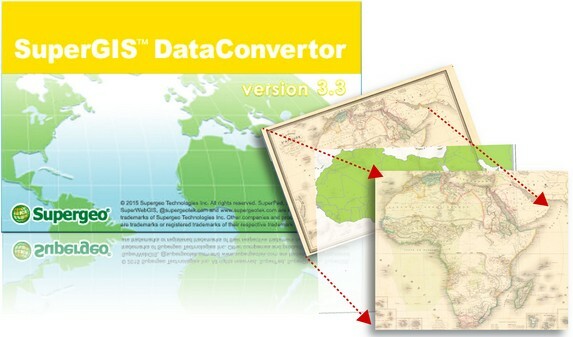 Users who install SuperGIS Desktop can own and manipulate the data rectification tool. The rectified layers containing coordinate system can be overlaid with other layers; therefore, the image layer can represent the real world precisely. With SuperGIS DataRectifier, users are able to rectify feature layers and raster layers such as the distorted image data caused by the machine or human errors. Also, an image without coordinate system can be rectified to create a corresponding coordinate system. 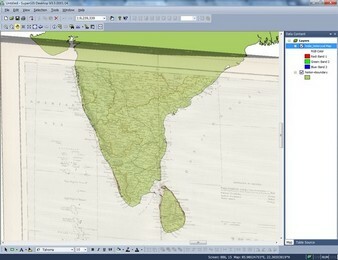 The figure shows a rectified historical map overlay on vector data correctly. SuperGIS DataRectifier is a stand-alone application. Users can do rectification work in separated windows. With user-friendly interface, you can modify, import, and export the coordinate values of ground control points to effectively manage the ground control points. The whole new map viewing toolbar separates the source layers and the reference layers, that provides convenient methods to browse and select ground control points to accelerate processing and improves the accuracy of ground control points. GCP data decides the accuracy of rectification. Generally, GCP (Geodetic Control Point) data is a set of points provided by professional organizations. Users can add a set of points on source layer corresponding to the GCP data on reference layer. After implementing rectifying, SuperGIS DataRectifier will rectify the source layer based on the GCP data from reference layer. GCP Manager enables you to view, modify, add, and delete XY coordinates of GCP. The loaded GCP data can be saved, and GCP Manager can help you to manage the GCPs on the layers efficiently. GCP Manager will calculate Residual and RMS Error as 4 GCPs added. Users can adjust the GCPs and get a better rectification result. Complete reference information can strengthen the quality of rectification. 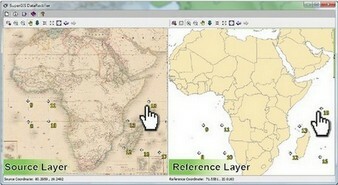 Users can add reference layers and manage them with Layer Manager. 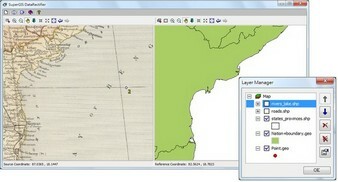 Layer Manager is a modeless window; users can manipulate and view the layers in the main screen of SuperGIS DataRectifier at the same time. Thus, you can switch layers in Layer Manager and the main screen of SuperGIS DataRectifier swiftly to modify the settings of each layer. To satisfy various file applications, SuperGIS DataRectifier supports *.LAN, *.JPG, *.GEO, and*.SHP formats. Consequently, the usability and applications of the data will be improved significantly.